Here we go again. The popular press is once again misinterpreting and overstating infectious disease issues (Ebola anyone?). NBC reported that CDC Warning: Flu Viruses Mutate and Evade Current Vaccine! Uh oh. The Guardian blared headlines that Flu vaccine protects against wrong strain, US health officials warn. Run away, it’s the apocalypse! At least the Health Ranger hasn’t posted anything on Natural News. I should have waited another day. The Natural News publishes its version, CDC issues flu vaccine apology: this year’s vaccine doesn’t work!, using its typical provocative and deceitful headline click-bait. Time to get a cup of coffee and look at this story a bit more rationally, without the explosive headlines. What did the CDC really say? Influenza A virus subtype H3N2 (H3N2) is a subtype of influenza A that causes flu in humans. It is a type of swine flu, and can cause serious outbreaks. What the CDC has found in early investigations of the 2014 flu season is that about half of the viruses so far identified are “drift variants.” This means that the H3N2 has undergone a mutation in its genetic code that has resulted in an antigenic change. That is, the virus has changed its “appearance” to the immune system as if it’s completely different, as a result of a random genetic mutation, and the “drift variant” can avoid detection and destruction by the immune system, even if vaccinated against the pre-mutated strain. What does this have to do with the vaccine? The CDC and other national public health organizations, along with the World Health Organization, meet, usually in February prior to the next flu season, and try to ascertain which flu variants may be the most prevalent in the upcoming year. Because all flu viruses mutate frequently (if those evil pathogens wouldn’t mutate, we’d have lifelong immunity), the CDC, WHO and other groups gather together in a process called a “match” to publish their best ideas on which strains of flu will be most prevalent in the upcoming flu season. They are not throwing darts at a dartboard, they compile the best evidence which strains have mutated enough and may be pathogenic enough that they should be included in a vaccine. Some mutations aren’t that serious, and prior year’s immunity may prevent infection from flus with small changes. The match has to be done so far in advance, because flu vaccine manufacturers require substantial lead time to develop, test, manufacture and distribute the vaccine–sometimes a mutation in a flu strain may occur after the match meeting, and the strain isn’t included in the new vaccine. The match creates a Northern Hemisphere and Southern Hemisphere version of the vaccines, because there might be some variants that are prevalent during the different flu seasons for each hemisphere. This year, the CDC has observed (through scientific collection of data, not anecdotal blather) that the H3N2 strain has mutated enough that the current vaccine may not prevent its infection. More proof that the flu vaccine is worthless! Hardly. First of all, 50% of H3N2 variants are stopped by the current vaccine. And it doesn’t matter if the H3N2 variant has mutated, any version of it is pretty potent, one of the most dangerous flu strains currently in circulation. Furthermore, the vaccine is still useful in preventing other types of flu like H1N1, Type B Massachusetts, and Type B Brisbane (for some vaccines). One more thing. It is probable that the H3N2 vaccine may have enough reactivity with the mutated viruses to actually reduce their pathogenicity by giving the immune system a head start because the vaccine still conferred immunity against some parts of the H3N2 mutated virus strain. Until data is accumulated to confirm the supposition, we have enough biological plausibility that despite the new H3N2 variant’s changes, the current vaccine may reduce the risk of hospitalization and more serious issues with those who contract H3N2. I never understand the logic of some people who buy into the Nirvana Fallacy–if it’s not perfect, it’s useless. Right now, we don’t have any magical preventive measures for cancer (well, except for losing weight, staying out of the sun, and stop smoking), but people will eat cranberries and kale, without any evidence that it works, in some belief that they’re preventing cancer. But talk about the flu vaccine, and all we get are people who invent dumb reasons to avoid the vaccine, or rely upon easily debunked myths. Or both. Then the CDC doesn’t think the flu vaccine is worthless? People with chronic and acute medical conditions like diabetes, heart disease, weakened immune systems, and others. The flu vaccine is incredibly safe. It’s fairly effective, though that can vary from year to year as flu variants mutate, like this year. 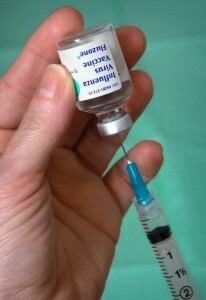 This year’s vaccine may not be able to prevent a new variant of H3N2 flu, but it may lessen the symptoms of the variant. Get vaccinated against the flu. It’s safe. It’s effective.